"Not all who wander are lost." -- so goes the bumper sticker that launched a thousand pointless journeys. I would have been absolutely tickled had Kelly Reichardt ended her film Meek's Cutoff with a slow pan over to the back of a covered wagon and revealed that one of the pioneers was sporting this totem. Forget that it would be an anachronism. It still would have been brilliant! Not that Meek's Cutoff isn't brilliant anyway. It kind of is. It also kind of isn't. Indecision seems to be its major emotion. The film is written by Jonathan Raymond, who worked with Reichardt on her previous directorial efforts, Old Joy and the emotionally rich Wendy and Lucy. Their new film tells the story of a wagon train searching for the Willamette Valley in Oregon in 1845. The title refers to a trail the Meek brothers blazed in an effort to avoid the Blue Mountains, where they believed the Cayuse Indians would attack them. The film focuses on one half of the expedition, of three wagons that split from the main group with Stephen Meek (Bruce Greenwood). Among them were the young Gately newlyweds (Paul Dano and Zoe Kazan); the widower Tetherow and his new wife Emily (Will Patton and Michelle Williams); and the Whites, consisting of father, son, and pregnant mother (Neal Huff, Tommy Nelson, and Shirley Henderson). Whether or not this group is lost or, as Meek puts it, "finding their way" quickly becomes a bone of contention. Water is running low, and their destination seems to perpetually be just two days away. This question of whether there is anything just over the next ridge sometimes turns existential, and Meek and Emily in particular get into sharp debates about the difference between men and women, trust, and the inevitability of destiny. Most of the time, though, they just wander. There is lots and lots of wandering. Wandering with one squeaky wagon wheel providing a sparse musical score. It's enough to try the travelers' patience, and I am sure the patience of plenty of moviegoers, as well. It's not that nothing happens, it's that Raymond and Reichardt don't want to romanticize what does, and the movie grows dusty and parched and it stays that way. From a plot standpoint, things heat up a little when the group captures a Native American (Rod Rondeaux) who has been following them, and the "savage" is forced to guide them to water. The language barrier means no one knows if he's really saving them or leading them to their doom. More debate between Meek and Emily follows. Note that I say Meek's Cutoff will try some moviegoers' patience; it didn't necessarily try mine. I emerged from the theatre somewhat dazed and a little thirsty myself. It's an experience, that's to be sure, and one that doesn't at all telegraph where it's taking the viewer. 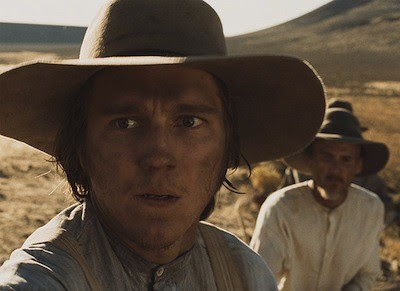 It only occurred to me in the final 20 minutes, when the travelers were manually lowering their wagons down a steep hillside with a rope, that what Reichardt had done was make a Werner Herzog movie set in the American West. Like, say, Fitzcarraldo or Aguirre: The Wrath of God, Meek's Cutoff isn't a movie you enjoy in a conventional sense, but one you endure alongside the hapless souls stuck on their inevitable collision with whatever grim fate awaits them. Reichardt and cinematographer Chris Blauvelt, who was also a camera operator on Joaquin Phoenix's twisted journey I'm Still Here [review], shot Meek's Cutoff on location in the desolate Oregon wilds, filming their Western on old-fashioned film at an old-fashioned 1.33:1 aspect ratio. This combination makes for a movie that looks like a classic cowboy picture but that feels like a soul-searching American indie. Most of Meek's Cutoff looks to have been captured in natural light, making for sun-bleached vistas and the blackest of black nights, the darkness only pieced by fires and lanterns. Dialogue is sparse, and the actors all work with the growing desperation, delivering performances that slowly implode. Only Greenwood gets much showing off, telling tall tales that do more to diminish his reputation than enhance it. And, of course, there is Michelle Williams, who delivers one of her least showy performances as Emily. Reichardt uses the actress' comfortable screen presence to make her the emotional center of Meek's Cutoff. Emily is intelligent and gutsy, though reserving her gumption for when it really matters. It's clear early on that if we're following anyone here, if we expect any of these characters to discover the way out, it will be her. Williams is careful in how she inhabits the part, she keeps some of her usual mannerisms dialed back, and she's no less convincing or charismatic for it. I'll admit, I think I could watch Michelle Williams in just about anything. They could cast her in a three-hour film about trying to get a stain out of a carpet, and I think she'd still be interesting to look at. I may be stretching, but I think it's largely down to Williams that I found Meek's Cutoff to be more human that what is on display in classic Herzog, and why I think Meek's Cutoff is a movie that I will likely see again, and depending on how that viewing goes, maybe many times after that. It's one I expect to grow in my estimation the more I sit with it, that only gets more interesting the better I come to understand it. Or it will dry up and crumble to dust, like so much detritus tossed out of a wagon on a pioneer's journey. Either/or.